October 1st, hard to believe. Here in Western NC, the leaves are just beginning to turn color, the air is crisp and cool, and the smells of fall are here. My favorite time of the year, can you tell? I also like this time a year from a traffic and earnings perspective too. As the weather gets colder, people stay inside more and use the internet. As we get closer to the holiday season, traffic and earnings tend to trend upward as well. I’m making one big change with this report: I’m dropping the traffic details. I’m making this change as I think showing traffic details for only Side Income Blogging along side the combined income from all of my sites is a bit misleading. Without understanding the context, people could assume I’m earning all the income from just this site, which is not true. Side Income Blogging is only a portion of my overall revenue. Showing traffic at any detail for all of my sites (I have 10 total) would be too tedious and time consuming, and frankly probably wouldn’t provide a great deal of value for you anyway. With that said, if you have any questions about traffic, feel free to ask me. The income numbers below represent income from all of my sites, including Side Income Blogging, Blue Ridge Mountain Life and my various niche sites. This income includes my services work as well. Adsense: $0.00 (I didn’t make payout this month, but will next month). A good income month, but not to the level of last months report. I didn’t get as much services work this month, but my other income from ads and affiliates was almost double last month and should be really good again next month based on expected earnings. Definitely a good month, but still not above the $1000.00/month mark I’m shooting for. My wife and I started a new “lifestyle” blog about the area we live in called Blue Ridge Mountain Life. So far, it’s been a huge hit and we’re really enjoying writing on it and working on the Facebook page. I’m excited as well, because it has the potential to become a really good money maker for us as well. The Facebook page growth has frankly shocked us and I wrote about how we achieved that growth in a recent article. Growth here on Side Income Blogging continues to be pretty flat. I was able to rank on page one for a fairly popular search term that converted well, which provided a decent bump in traffic but nothing huge. I’m still averaging around 200 – 250 visits per day. When I first started this blog, I fully expected to be well over 1000 visits per day by now. The blogging niche is very competitive and I just think it’s getting more and more difficult to rank on Google these days. Over the past few months, I started four different new niche sites. One on bed bugs, one on electronic blood pressure meters, one on electric toothbrushes, and one on banjo tuners. The bed bugs site is an authority/information site, where the other three are product review sites. I really expected the bed bugs site to be the leader, as it’s a trending topic and frankly the site has a lot of useful and informative content. The site is growing, and beginning to rank and get some traffic from Google, but it’s taken a great deal of time. The niche is pretty competitive. I’m still hopefully to be able to rank in the top 20 for the main target keywords, but I don’t think that is going to happen fast. If I can manage to make it rank for the target keywords though, I think it will be a huge money maker for me. I expected the blood pressure meter and toothbrush sites to grow and rank at about the same rate. That hasn’t happened. The blood pressure meter site is doing really well, while the electric toothbrush site isn’t ranking well at all. Again, I think this is due to competition and me needing to do a little more keyword research and SEO optimization. I am very pleased with how the blood pressure meter site is doing, and at the current rate, I expect to be on page one for my main target keywords by the end of the year. I’m already earning about $50/month from the blood pressure meters site. 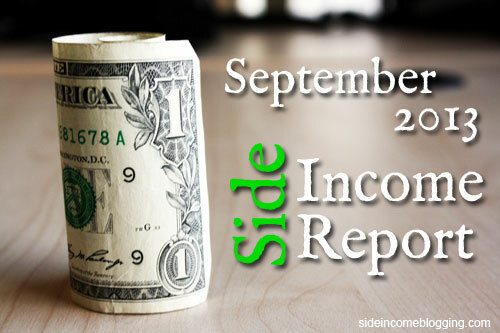 You’ll see that income start to show up in my next side income report. The last site I created was really a micro niche site, that targeted banjo tuners, and specifically electronic banjo tuners. Great idea, but it failed in execution. Turns out, and I should have known this, that when people are searching for “banjo tuners” they are looking for the actual tuning knobs not the electronic string tuners. As a result, the bounce rate was very high, in excess of 90%. I also didn’t spend enough time looking at keyword volumes, and it was lower than I initially thought. I decided to just “cut bait” on that site, and removed it late last week. I felt my time was better spent on my other sites. Building out niche sites is a bit addictive, and I’ve found that it’s really easy to spread yourself too thin and have more sites than you can frequently update. Content Freshness, especially on a new site is critical to successfully ranking and staying ranked these days in Google search results. If you can’t publish at least 1-2 articles a week on each of your new sites, you’ll struggle to rank well and it will take longer than expected. How did your sites do in September? My favorite time of the year too Larry, both for the weather and the internet marketing reasons that you mentioned. So, $1k/month is your goal now. Just curious – do you have aspirations of making this your full-time gig and quitting your day job? Like you, my niche sites pretty much stayed flat for September – but my affiliate income from my blog went up a little. Cheers to a great October! Thanks for all the information that you share about your websites. I am very interested to know how you and your wife will make money on your website “Blue Ridge”–which as you have shared has a growing Facebook readership? Hey Larry I really enjoyed your blog. People blog about just about everything and found it interesting that one of your niche blogs was about the electric toothbrush. I have a crazy love for my electric toothbrush but didn’t really think about blogging about it. I am reminded about when I bought the toothbrush. It was 1999! It still works as great as the day I bought it. Plus, it came with free lifetime replacement brushes. It was a great investment. I have gotten my moneys worth for sure. When you mentioned seo I wondered if your blog has an seo keyword score built in as mine does. I find it very helpful when I really want my blog to rank. Anyway, thanks for taking me down memory lane with my toothbrush! Matthew, $1k per month is a short term goal, but the longer term goal would be do make this a full-time gig, but to be very honest I just don’t see that happening. My income form my full-time job is very good, and includes good benefits. Earning that same income level from my blogging and services business would be tough. Hey Brad – current on BRML, I’m using a combination of Adsense and affiliates. Adsense seems to do really well, and cabin rentals and vacation related affiliates seem to do ok as well. Once I get more traffic, I plan to begin selling private ad placements to local businesses and merchants. We hit 5000 Likes on our Facebook page yesterday, and it continues to grow by more than 100 likes per day. Hi Carolyn, so glad to hear you enjoy the blog. I’ve just recently started using an electronic toothbrush, and wish I had started a long time ago. They really work great. Not sure what you mean by “a keyword score”. I do use the WordPress SEO plugin on my sites, which provides a color indicator for SEO optimization. The decision to drop the traffic report is still okay by me . What matters is to show readers what income and expenses have been made in the course of the month. I also find the details on the niche site updates pretty interesting. In the Internet marketing social bookmarking site – kingged.com, the above comment was left even as this post has been shared for marketers.